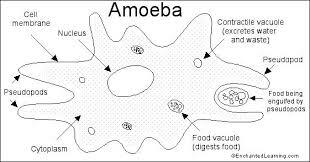 Talk of amoeba reminds me of an excellent teacher in tech college – following our session on amoeba he burst into the room in his velvet suit and bashed round the room, crashing into things and belting out words… he WAS a paramecium… and we were hooked! What a great example of a creative approach Sandra. It’s also synchronous to my own thinking this week about creativity needing a space for performance. For me this course is a real CPD experience -as well as demonstrating the value of online and open! Ah – spot on – you have named it, Sue – yes – performance! And whilst I do love the flipped classroom and projects and activity, I am not against the lecture per se – a great lecture can be a great performance. For me lectures are a bit like powerpoint – much maligned but when used well (creatively?) can be powerful aids to learning. The transfer of f2f lectures to online environments welcomes creative approaches, this was the subject of my subgroup on the course. Do you have any examples of creative ways to put lectures online Sandra? I wonder how your paramecium lecturer would have tackled this! I have been racking my brains on this one for a while now… The only way I literally put lectures online is to make one-minute, fast videos of what I want to say – and then have a website behind that that is more discursive and suggests follow up activities (http://learning.londonmet.ac.uk/studyhub/note.html). We did some work with students last year to see what sort of approach to reading worked best – and I think that it would translate to lectures. After the reading, we got the students to discuss and draw each chapter. when ready – they re-drew their drawing on the whiteboard and we filmed it… We separately recorded their brief audio… The Chris O’Reilly speeded up the drawing and overlaid the audio to produce animations… That might be a good way to put lectures online, after they had been delivered? These are great videos Sandra. thanks for sharing them. I was inspired by the drawing out of notes on the whiteboard and will give this a try myself!